I came to Queens from Colombia with my mom and my twin brother when I was a kid. By twelve years old, I was behaving really badly. My parents threatened to kick me out of the house. It was a false threat, but I didn’t really take it well — so I just left. I was homeless as a teen, and I got involved with the wrong people. I started selling drugs, and I ended up in prison at Rikers. I got out when I was 16, and decided I needed to go to school. But I ended up dropping out with only four credits. But then I saw this school called Co-op Tech — it was up on 96th Street. It was a trade school with a bunch of programs, including a cooking one. I had always wanted to cook. I enjoyed watching Ming Tsai and Emeril Lagasse and all those guys. I was always writing things down. So I got my GED, and enrolled in this school — and this time I decided to actually go to school. I met an instructor named Edwin Serna, and he was the first person to really give me a shot. He decided to train me for this cooking competition for high school students for scholarships. I won the competition. Usually, you get a scholarship to go the Culinary Institute of America, but I didn’t have the schooling or the GPA prerequisites. At the time, I was working on the side for a chef named Chris Lahey at BLT Prime — he convinced the competition’s organizers to let me go to the French Culinary Institute (which agreed to accept me with my credentials) instead. Around then, Chris also sent me to stage at Daniel. I was 17. It was amazing seeing all the copper pots and pans, how clean and shiny everything was, how the cooks were so meticulous, how they called back in uniform. It was a soigné kitchen. I fell in love. I harassed Jean-Francois, the Executive Chef there, for weeks, and finally, he gave me a job. I was the only Latino cook. I was working 70 hours at Daniel, and then I was at school 20 hours a week. I lost so much weight, I had bags under my eyes, but I was grateful for both of the opportunities. Doors had been opened for me, and I had to take what I was given and push through. Eventually, I had to leave Daniel because of family issues — I was taking care of my little brothers, and I couldn’t afford to do so on minimum wage. So Daniel [Boulud] sent me to help open DBGB Miami and be closer to my grandmother and brothers. Eventually, I was able to make my way back to New York. When I turned 25, I was working as the executive chef at Lexington Brass—I had taken over the restaurant when I was only 23, and it was incredible—but I wanted to go back to Michelin kitchens. So, I went from being executive chef at Lexington Brass to being a tournant at Café Boulud. But I worked really, really hard, and in a month, I got promoted to sous chef. After four months, I became the executive sous chef, my current position. We do these voyage menus at Café Boulud where we showcase different parts of the world, and last summer, Daniel told me he wanted me to represent my country, and inspire people with my food. It was humbling because Colombia is such a poor country; the cuisine is very much peasant food. I got to take certain dishes, break them down, and elevate them to Café Boulud’s level. I learned a lot about my culture and myself, and this huge crowd showed up to support my dinner. My eyes get watery thinking about [it]. I’m 26 years old, and I don’t want to stop. I don’t want to settle. I never expected to make it past the age of 21, but I saw the light at the end of the tunnel, and I went for it. I’m very proud of that. 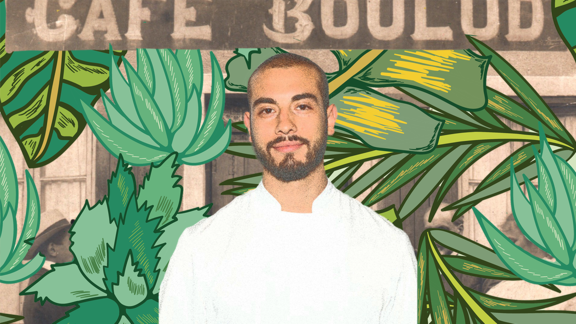 How Chef Yvan Lemoine's love for food transcended circumstance.